The redesigned sedan will come in two engine configurations: the M56, with a 5.6-liter V-8, and the M37, with 3.7-liter V-6. Editor's note: An earlier version of this story misidentified the two Mercedes-Benz nameplates mentioned in the 8th paragraph and the Mercedes nameplate in the 11th paragraph. 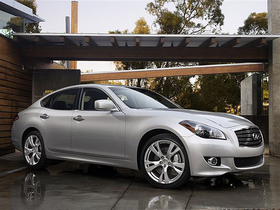 LOS ANGELES -- The gas pedal on the new Infiniti M sedan will be trying to tell its drivers something when it hits the market next spring. It will try to coach them into being more fuel-efficient drivers. The 2011 M, which was unveiled in Beverly Hills Tuesday night on the eve of the Los Angeles auto show, will offer a tech package that includes the “Eco pedal.” The pedal will be wired into the M's fuel management software and will put up a slight resistance to foot pressure when the car is being driven too aggressively for ideal fuel consumption. 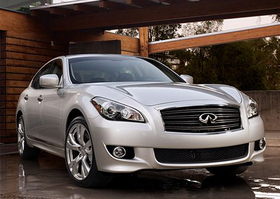 Like a few other automakers, Infiniti is not participating in the Los Angeles show this year. But brand executives unveiled the sedan off-site for its world premier. The redesigned sedan will come in two engine configurations: the M56, with a 5.6-liter V-8, and the M37, with 3.7-liter V-6. Prices have not been released. The M also will have a blind-spot intervention system. Ben Poore, Infiniti Business Unit vice president, says the Eco pedal and other new M technologies will help stimulate sales for the luxury marquee's flagship despite the struggling U.S. economy. Poore predicted that the mid-sized luxury sedan segment, including his competitors, the BMW 5 series and the Mercedes-Benz E class, will see a resurgence in 2010 and 2011. He said Infiniti's reading of the market is that the economic pall is prompting many shoppers to trade down from full-sized luxury models such as the BMW 7 series, Mercedes S class and Lexus LS. “Customers are stepping away from traditional prestige brands right now, but they still want the kind of technology they were getting at higher price points,” Poore argues. Sales of the 7 series are down 33 percent for the first 11 months of this year, and S-class sales are down 40 percent. M sales are down 29 percent. The M also will have a blind-spot intervention system. That technology detects the presence of another vehicle in the M's blind spot during a lane change and gently tugs the M's steering wheel to guide the car back to its original lane.